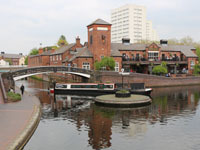 The Birmingham Canal Company, later the Birmingham Canal Navigations Company, opened the Birmingham and Fazeley Canal in 1789 to connect with the Coventry Canal. Planning had started nearly ten years earlier but construction was delayed through disagreements between the canal companies and allegations of poor workmanship. The canal transformed Birmingham, changing it from a terminus into a through route from the Black Country and the result was boats choking the canal as they worked all day and night. The unique island in front of the NIA is now generally known as Old Turn, however it is technically Deep Cutting Junction. It dates from World War Two and the direction sign was installed by the BCN Society in 1983. Going under Tindall Bridge and past the old Toll House, you start to descend 81ft through the Farmer's Bridge Locks or 'the old thirteen' with Cambrian Wharf and the former Newhall Branch to the right. The Islington Place Footbridge is a contemporary antidote to all the Horseley style bridges that you've seen and, as you skirt the Jewellery Quarter, instead of factories, the canal is overshadowed now by modern apartments and office buildings. Saturday Bridge, where the story goes that boatmen used to get paid on that day of the week, is between locks 4 and 5. Between locks 8 and 9 you'll go over Whitmore's Arm which served Elkington's, once the world's largest metalworking factory that stood on both sides of the canal and specialized in electro-plating. The company were responsible for both the men's and women's Wimbledon tennis trophies that are played for today and more jewellery is still produced in this area than anywhere else in the country. The nearby Birmingham Assay Office, set up at the insistence of Matthew Boulton, is the busiest in Europe. Tourists, and walkers of a nervous disposition may baulk at the cramped tow path under Newhall Street, especially as the canal then disappears under Brindley House, a lluxury apartment block built on stitls. After becoming slightly less claustrophobic, you then plunge into the heart of darkness that is the huge unlit cavern below the railway lines going into Snow Hill Station. Emerging into daylight with signs welcoming you to the Second City at the bottom lock, the not unpleasant landscape until Newtown Row is of old factories and remnants of the many wharfs that once lined the canal plus groups of friendly drunks and the occasional angler. Aston Junction, where the Digbeth Branch departs through Ashted Locks to the Typhoo (Tea) Basin and Grand Union, is the first piece of greenery you'll see since the City Centre. The Aston flight of locks drop the canal by another 70ft. and for some time it seems as if the world has turned its back on the canal. However, as the Lock Cottage at Thimble Mill Lane is approached,.you'll see that even bluebells can flourish here in the spring. The canal now has a more open aspect but you wouldn't call it pretty as you continue over a succession of disused wharfs and arms until Cuckoo Wharf moorings. with Salford, and above it Spaghetti, Junction looming in the distance. Bearing right at the junction, you'll find yourself with canal on one side, refuse strewn River Tame on the other and a motorway overhead. Soon after these delights there's a large electricity sub-station and you disappear again under a factory built over the canal before emerging at Erdington Hall Bridge.